Music and the Arts express our love of Christ through the beauty of sight and sound. 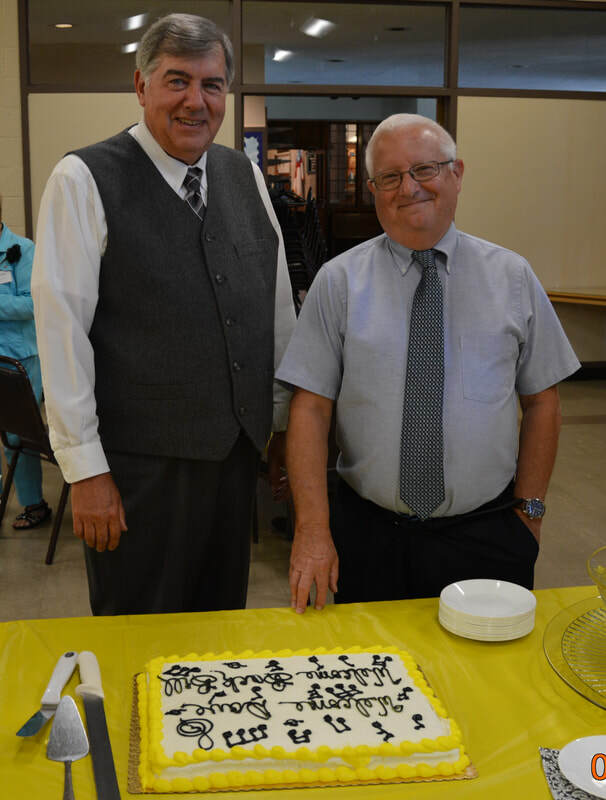 Music Director David Carnell (left) retired from Trinity United Church of Christ, Canton, Ohio, in 2015 where he served as Music Director-Organist for 26 years. He directed and served as accompanist for a varied program of nine music organizations for children, youth and adults in choral and instrumental music. He is a member of The American Guild of Organists and holds the Choir Master, Colleague and Service Playing certificates of the AGO. He has been on the adjunct music faculty of Malone and Mount Union Colleges where he taught classes in church music and directed hand bell choirs. His wife, Christine, is a retired teacher from the North Canton City School District. They are parents of two adult children, Katherine and Kevin. Music Director Emeritus William Kendrick (right) possesses a vast background of education and experience in church music. He specializes in classical selections, and frequently writes his own for notable/seasonal services. Local artists frequently exhibit their works in our Guild Hall Gallery.